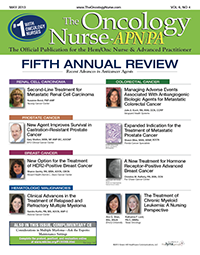 This month’s Fifth Annual Review issue of The Oncology Nurse-APN/PA® (TON) highlights some of the recent advances in anticancer care. The US Food and Drug Administration (FDA) approved axitinib (Inlyta; Pfizer, Inc.) for the treatment of patients with advanced renal cell carcinoma after failure of 1 prior systemic therapy. This approval was granted on January 27, 2012. For more information about the FDA approval, see http://www.fda.gov/Drugs/InformationOnDrugs/ApprovedDrugs/ucm289439.htm. The US Food and Drug Administration (FDA) approved ziv-aflibercept injection (Zaltrap, Sanofi US, Inc.) for use in combination with 5-fluorouracil/leucovorin/irinotecan (FOLFIRI) for the treatment of patients with metastatic colorectal cancer that is resistant to or has progressed following an oxaliplatin-containing regimen. The US Food and Drug Administration (FDA) approved enzalutamide (Xtandi; Medivation, Inc., Astellas Pharma US, Inc.) for the treatment of patients with metastatic castration-resistant prostate cancer who had previously received docetaxel. Abiraterone acetate is a novel antiandrogen agent that has recently received an expanded indication for treatment in men with metastatic castration-resistant prostate cancer (mCRPC). The US Food and Drug Administration (FDA) approved pertuzumab (Perjeta; Genentech) for use in combination with trastuzumab and docetaxel for the treatment of patients with HER2+ metastatic breast cancer who have not received prior anti-HER2 therapy or chemotherapy for metastatic disease. The US Food and Drug Administration (FDA) approved everolimus (Afinitor; Novartis Pharmaceuticals Corporation) for the treatment of postmenopausal women with advanced hormone receptor–positive, human epidermal growth factor receptor 2 (HER2)-negative breast cancer in combination with exemestane, after failure of treatment with letrozole or anastrozole. The US Food and Drug Administration (FDA) approved carfilzomib (Kyprolis; Onyx Pharmaceuticals, Inc.) for the treatment of patients with multiple myeloma who have received at least 2 prior therapies and who have demonstrated disease progression. Chronic myeloid leukemia (CML) is a clonal proliferative disorder of the hematopoietic cells of myeloid lineage1-3 driven by a reciprocal translocation between chromosomes 9 and 22, resulting in the so-called Philadelphia (Ph) chromosome.